罗峰, 胡强, 刘宇. 基于CAN-FD总线的车载网络安全通信[J]. 同济大学学报(自然科学版), 2019, 47(3): 386-391. 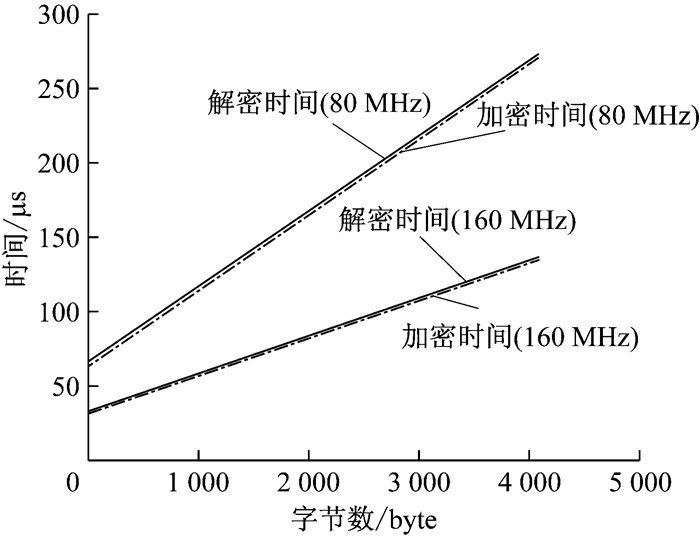 DOI: 10.11908/j.issn.0253-374x.2019.03.012. Abstract: A security method for vehicle communication network based on controller area network with flexible data-rate (CAN-FD) was established with data encryption and intrusion detection. 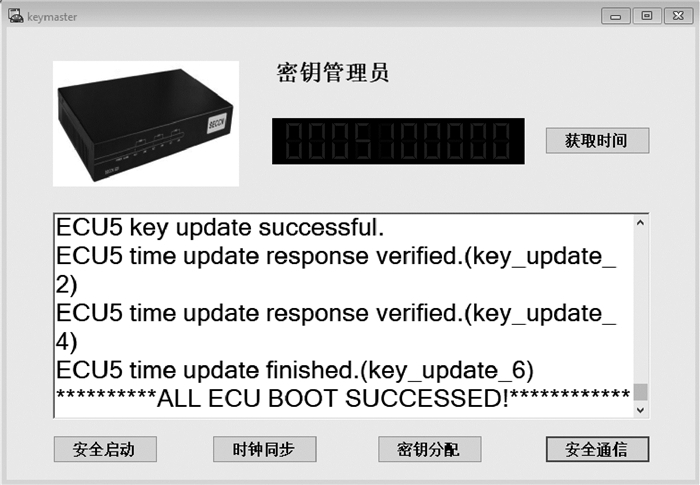 Secure communication protocols for vehicle network including secure transmission, secure boot, time synchronization, and key distribution were proposed, and a network simulation model was established to verify the validity of the secure protocols. 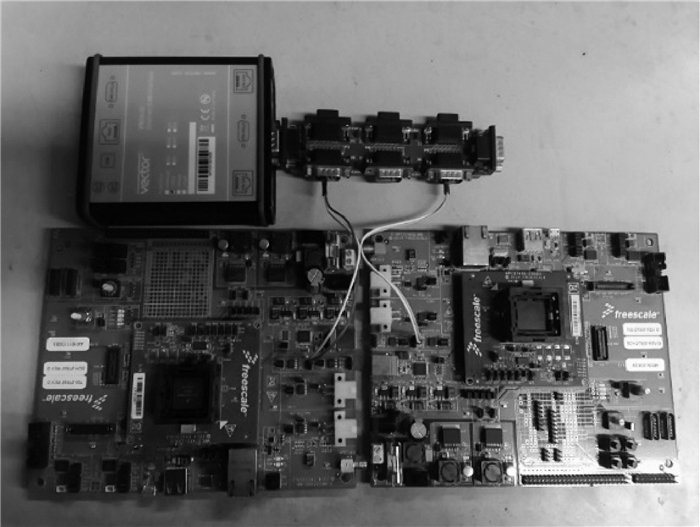 Secure communication nodes based on hardware instance were established to test the actual communication performance and encryption performance of the hardware nodes. 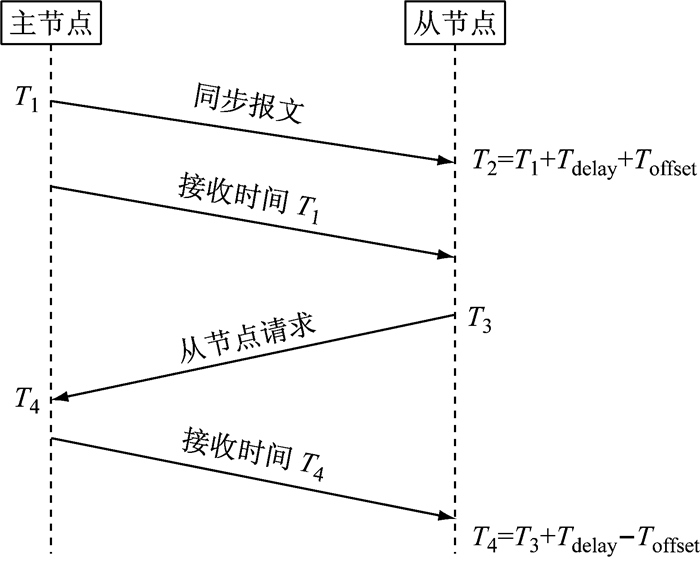 Aiming at the potential attack modes of the vehicle communication network, the Dolev-Yao intruder model attack and the denial of service attack were used as the test methods to test the security of communication model and verify the intrusion detection function. 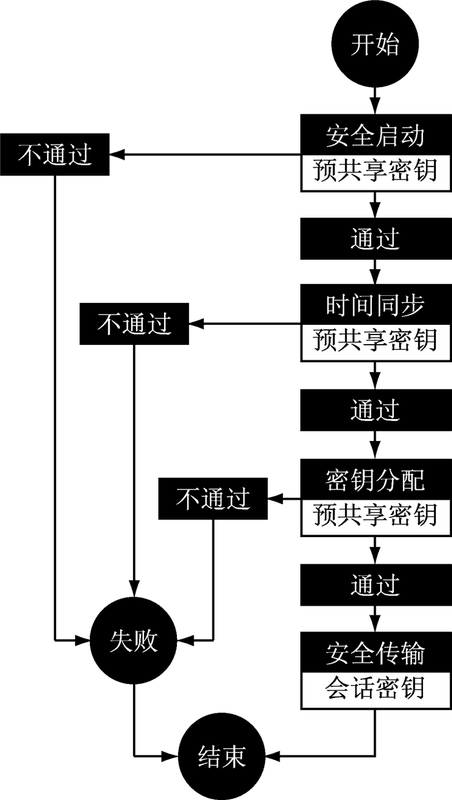 And the judgment index of the network intrusion detection was determined. 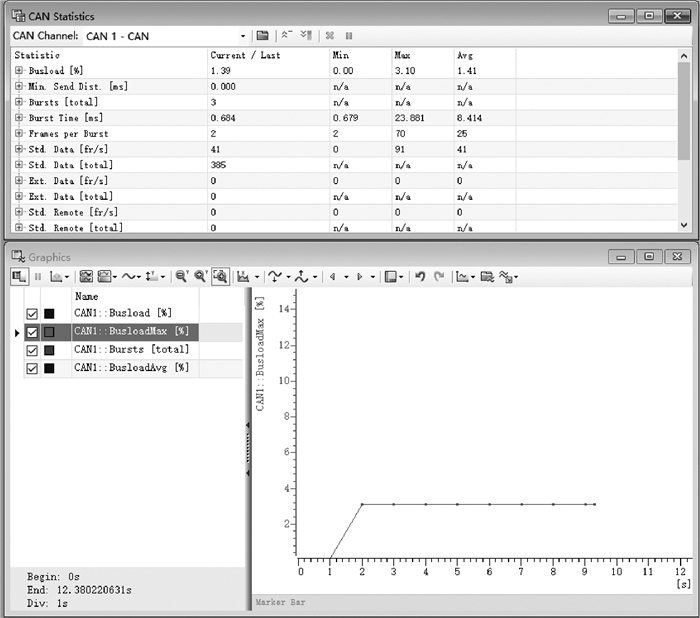 The experimental results had confirmed the security and usability of the method. 智能网联汽车是当前汽车技术领域的一个重要发展方向.随着汽车网联技术的发展，汽车上对外的接口逐渐增多，针对汽车的网络攻击成为了一个新的问题.当前对于汽车网络的安全通信研究中，Herrewege等基于CAN+ (controller area network +)，将数据场16个字节中的15个字节用于消息验证，通过哈希加密函数计算出数据帧的签名校验，实现通信的安全认证，但由于只有1个字节可以用于数据传输，会造成总线负载率升高.Hartkopp等将CAN总线数据场的4个字节用于对报文和时间戳的认证，但是使CAN通信的有效数据降低，造成网络负载率的上升.Woo等对CAN总线通信进行了无线攻击，并提出一种安全协议对CAN总线通信进行安全保护.针对高速数据的传输，Woo等提出了一种基于CAN-FD (controller area network with flexible data-rate)加密通信的方法，实现了在汽车网络上进行数据的分级加密传输，但缺乏相应的时间检测机制.国内学者在CAN总线通信的身份认证方面提出了一种动态口令身份认证方法，实现通信的完整性检查.在入侵检测方面，国内的研究者提出了一种运用信息熵的算法对通信入侵的异常现象进行检测的方法，但未体现该方法在汽车级微控制器的计算处理能力下的性能效果. 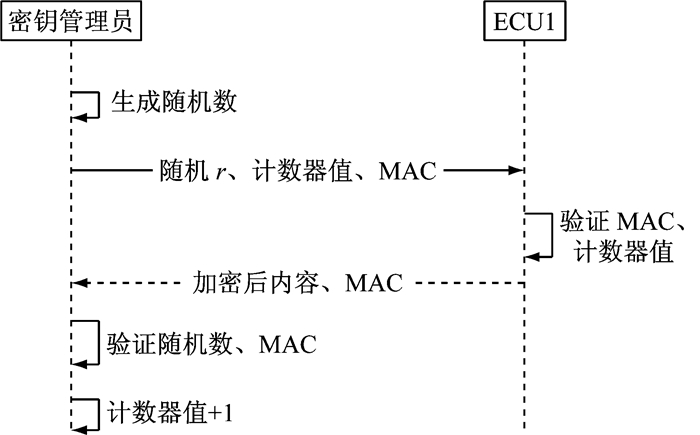 AES(advanced encryption standard)加密算法作为一种对称加密算法，具有执行计算时间短，兼容软件加密、硬件加密的方式等特点.本文中安全传输协议采用AES-128算法对传输数据进行加密和MAC(message authentication code)计算.CAN-FD总线中，数据场有64个字节(512位)，将前48字节数据进行密文传送，后16个字节作为MAC校验.16字节(128位)的AES-MAC理论上的暴力破解次数为2128，具有足够的安全性. 安全通信系统通过CANoe软件进行仿真验证，搭建网络仿真模型.设置CAN-FD通信速率为2 Mbps，时间戳允许误差为100 ms.仿真过程为密钥管理员和5个ECU节点之间实现安全启动、时间同步、密钥分配以及安全传输协议.利用CANoe设计仿真控制面板，如图 5所示.仿真程序中安全协议执行的流程如图 6所示. 仿真实验中CAN-FD的通信速率为2 Mbps，连续实现安全启动、时间同步、密钥分配协议用时约为20.8 ms.如图 7所示，在仅执行安全协议过程中，CAN Statistics数据栏的统计结果显示网络仿真通信最大负载率为3.10%，平均负载率为1.41%.因此采取该安全通信机制不会对总线负载率造成太大压力.在安全会话过程中，CAN-FD报文的数据场中前48个字节用于数据传输，后16个字节用于数据校验，数据场的传输利用率为75%，通信效率较高. 加密和解密的计算时间测试结果如图 9所示.当微控制器的时钟频率为160 MHz，使用AES-128算法连续加密或解密1 600字节所消耗的时间约为71.6 μs，平均每帧报文中由于加密和解密造成的额外延时为5.73 μs.该延时远小于CAN-FD报文的传输周期时间.因此，引入该安全通信机制并不会影响网络通信的实时性. KOSCHER K, CZESKIS A, ROESNER F, et al. Experimental security analysis of a modern automobile[C]//IEEE Symposium on Security and Privacy. Oakland: IEEE, 2010: 447-462. VAN HERREWEGE A, SINGELEE D, VERBAUWHEDE I. CANAuth - A simple, backward compatible broadcast authentication protocol for CAN bus[C]//ECRYPT Workshop on Lightweight Cryptography. Louvain-la-Neuve: ECRYPT, 2011: 1-7. HARTKOPP O, REUBER C, SCHILLING R. Message authenticated CAN[C]//Embedded Security in Cars Conference. Berlin: ESCAR, 2012: 1-7. RUDDLE A, WARD D, WEYL B, et al. 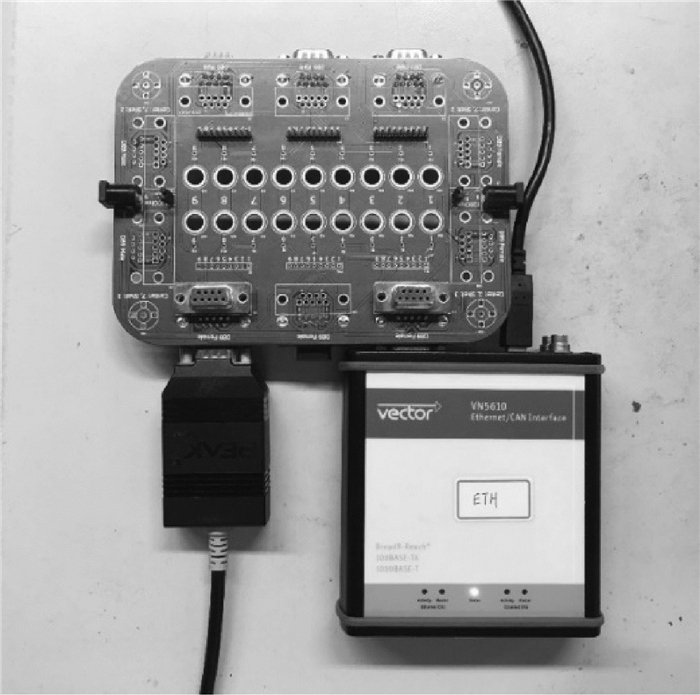 Deliverable D2.3: Security requirements for automotive on-board networks based on dark-side scenarios[R]. Darmstadt: EVITA Consortium, 2009. HARTWICH F. CAN with flexible data-rate[C]//International CAN Conference. Hambach Castle: CIA, 2012: 1-9. National Institute of Standards and Technology. Advanced encryption standard (AES): FIPS PUB 197[S]. Gaithersburg: Federal Information Processing Standards Publications, 2001. IEEE Instrumentation and Measurement Society. IEEE standard for a precision clock synchronization protocol for networked measurement and control systems: 1588-2008[S]. New York: IEEE, 2008. ESCHERICH R, LEDENDECKER I, SCHMAL C, et al. SHE-Secure hardware extension functional specification[S].[S.l. ]: HIS AK Security, 2009.